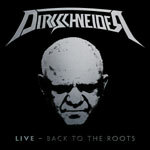 To begin touring as the voice of Accept and playing songs exclusively from the band's 80's material up to the time when he got the boot because the other guys were looking for a new and sugary sound in 1987 is definitely Udo Dirkschneider's best career choice, financial-wise, since he went separate ways with Wolf Hoffmann and Peter Baltes for the third and almost certainly the last time about a decade ago. When this whole touring cycle started everybody was told that this is his way to say goodbye to these songs for good and then concentrate only on the U.D.O. stuff once this tour is over. The tour is still moving forward at this point though and there are dates booked even in 2017 already and Live - Back To The Roots is of course another piece of the puzzle to get his share out of the band one last time. Nothing wrong with that, the way I see it, because this man really was a big part of the reason that Accept made it in the first place. Yet, if you see things in a different perspective, Udo knows damn well that he's 64 right now and won't be touring forever and when this current tour is done, maybe there isn't going to take long before he announces a new U.D.O. album followed by some kind of farewell tour with that band to finish off things once and for all. The songs on this live album are in their original version for the most part absolutely stunning, but I know that a few hard-core fans would have loved the idea of getting a few songs off his 90's records with the group too and in particular from 1993's Objection Overruled. Personally I wouldn't have mind some songs off that record either, yet most of his audience is generally fondest of the material presented now. As is customary in the live environment the songs are occasionally extended by Udo's well-established sing-a-longs. The vocalist used to fill his live-sets to the breaking point with that type of crowd activity, but has now taken that feature down to a bearable level and I'm more than happy about the decision to do so. It's also a tradition to extend the songs with longer guitar solos and that part is unfortunately and unquestionably lacking the skills of Wolf Hoffmann and is probably what I see as this live recording's biggest disadvantage. Even if the songs on this album are close to being rock solid and the boys in the band are trying to stay kind of close to the original recordings, it's not Accept that's playing the set and the sound feels slightly thinned when it's not performed by the original guys. Yet the songs have such a high standard in its core, so it's impossible for me to not like what I hear anyway. Udo Dirkschneider has never once in his life relied on an amazing vocal ability, but on character and being a fantastic complement to the music performed behind him. You can still easily recognize his voice, even if his strength isn't really there anymore. He has lost quite a bit in capacity while aging, yet his factual presence and the nostalgia factor of having him singing all these great songs are elements that can't be ignored and even if many old fans see this whole thing as a cover band it's still making this live album into a fine document of the man's early days in the limelight.